In uncertain and challenging times, America relies on renewal. It needs individuals and communities to rise up with ideas and solutions that create change, one step at a time. Allstate knows well the power of local solutions to resolve national challenges. The nation’s second largest insurer, Allstate is a network of 10,000 small businesses. The brand is deeply connected to its local roots and committed to supporting the communities it serves. Beginning in 2009, at the later part of the country’s economic recession, Allstate sought to represent the voices of America’s middle class. At a moment when the nation was struggling with uncertainty and divisiveness, Allstate saw an opportunity to inspire hope by lifting up local stories of economic renewal in communities nationwide. Local leaders and innovators are doing meaningful work across the country, yet their efforts can go largely unrecognized on a national scale. Allstate saw a need to connect them to one another, empower them, and offer them as inspiration to other communities across the country. In short, it saw the opportunity to build a community of ambassadors and drive a bigger conversation around local ingenuity across America. As a result, Allstate could also be recognized nationally for its work supporting these changemakers. Previously, Allstate had generated “engagement spikes” on key social issues, but it had not created the long-term impact it needed to elevate recognition of its brand commitment to local communities. Together with Allstate we launched The Renewal Project, an integrated marketing campaign chronicling the social innovation taking place in communities across the country, as America renews itself from the ground up. 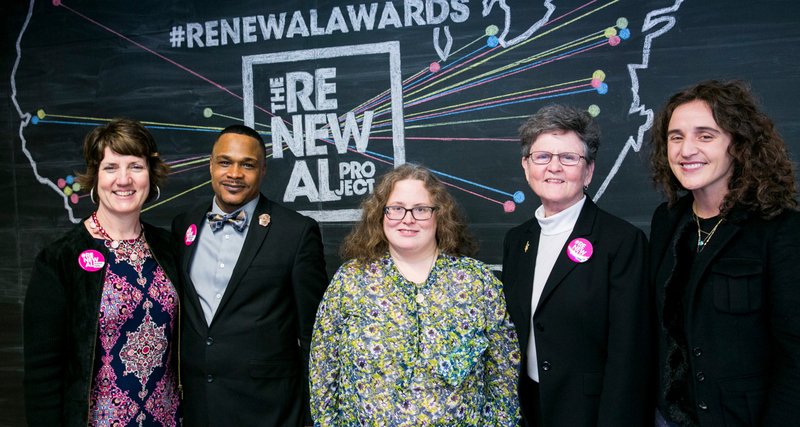 The Renewal Project reaches local and national audiences, fueling a nationwide conversation around community innovation, resilience, and ingenuity, and reinforcing Allstate’s commitment to social good. Further, Allstate advances these innovative efforts through tens of thousands of dollars of funding and support, enabling these communities to take their ideas and solutions even further. Through The Renewal Awards, Allstate spotlights local innovators in communities nationwide who are creating meaningful change and progress in their communities. Throughout the year, Allstate profiles nominees across its social channels. At the annual Renewal Summit, Allstate honors Renewal Awards winners and lifts their stories in celebration and as inspiration to community leaders and changemakers nationwide. The awards culminate in five winners receiving a $20,000 award to further their work, and five runners-up receive a $10,000 award. The Renewal Project reaches its different audiences through a multitude of digital touchpoints. Renewal Project content spans a dedicated website (therenewalproject.com), regular native and underwritten editorial content on The Atlantic; editorial content surrounding The Heartland Monitor Poll, which takes the country’s pulse on urgent economic issues; social content across Facebook, Instagram, and Twitter; and cross-platform coverage and promotion of The Renewal Awards. The Renewal Project convenes audiences and builds momentum through major events, including The Renewal Series regional events, national events with AtlanticLIVE, on-site activations at events like Aspen Ideas Festival and Washington Ideas, and the annual Renewal Summit. Through these events, Allstate has grown a community of vibrant local leaders, supporters, contributors, award winners, and partners. The momentum from these events and content extends beyond the moment through sustained social conversations unfolding across social media. At the center of The Renewal Project is a social newsroom, fueled by a dedicated team of editors and producers creating a constant drumbeat of social-first, highly shareable content—including articles, videos, polls, and events coverage. This multi-platform digital hub serves as the connection point for all of Allstate’s efforts around renewal and for all of its audiences. It allows audiences to experience Renewal Project content wherever they are, without going to a website or attending an event.